My earliest memory of the processed meat known as SPAM comes from watching my father heat it up to eat it over toast as he watched late-night movies on TV during the weekend (this was before he was finally convinced to join humanity and buy a VCR). Many years later, I did buy a few cans now and then during my twenties when times were lean, but I pretty much stayed away from the stuff until I visited a supermarket in Hawaii and was impressed by how many cans of Spam I had seen there. shoulder and ham). When Renata and I walked into a breakfast place in Waikiki, I almost felt like I was sitting in that restaurant in the infamous Monty Python sketch, since the menu included “spam and eggs” as part of the options. I became intrigued on the popularity of SPAM in Hawaii, and after Renata and I returned from our trip I did some research and learned that it had been introduced there during World War II and quickly became a staple because it was something that was not only portable but also had a long shelf life – ideal their weather conditions, which can suddenly change. 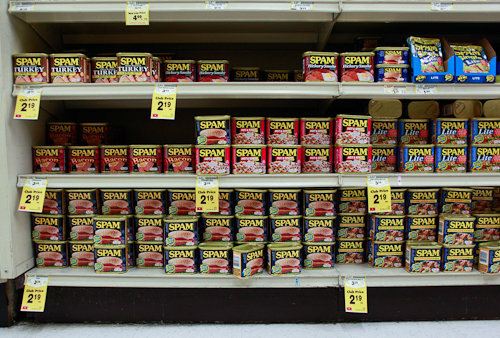 According to my research, Hawaii residents consume as much as 7 million cans of SPAM (or “Hawaiian steak.” as it is jokingly referred to there) a year – an astonishing amount considering that the population there is just under 1.5 million. 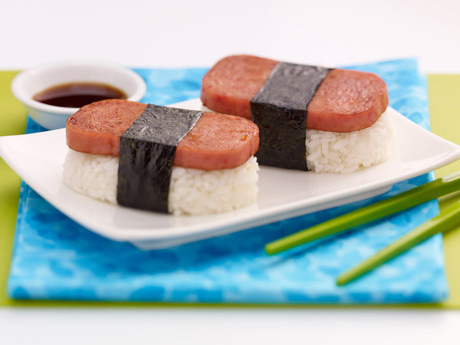 Soon I found that there are numerous recipes – many actually Asian-inspired – made with SPAM, and that is not just making them with eggs ,fried rice or the sushi-like musubi. After browsing for a while, I decided to temporarily forgo my pork ban in order to purchase a couple of cans and try a few recipes, starting with the Hawaiian SPAM burger that I included with my final installment of the Hawaii report I wrote over the course of seven weeks (I am still amazed I was able to get so much out of a ten-day trip). The result was actually quite surprising – the combination of grilled pineapple and peppers balanced well with the flavor of the meat (which is also grilled). Another good result was a breakfast skillet made with shredded potatoes, cheese, bell peppers, onions and eggs – the result was so positive that Renata didn’t even notice it was SPAM until I told her hours later. Now, will I go the full Hawaiian and start stocking up on SPAM? I honestly do not think so, because we are too fond of eating fresh meals. Also, there is the fact that processed foods are not exactly good for you. Having said that, I am glad to have an extra option out there, especially if we are faced with extreme weather like when hurricane Sandy hit and left us out of power for three long days. skillet; cover. Cook over medium-low heat 8 to 12 minutes or until set.